According to BIS Research analysis, the global small arms market generated $8.37 billion in 2018 and is estimated to grow at a CAGR of 3.51%, during 2018-2023. • The study examines the prime supply-side factors, which affect the growth of the market, along with the current and future trends, market drivers, restraints, and challenges prevalent in the global small arms market. • A detailed market share analysis has been included in this report which focuses on the ¬key market developments and strategies, followed by the top players in the market. Additionally, a market share analysis diagram has been included in the existing study to analyze the competitive strength of the players in the global small arms market. • A detailed Porter’s Five Forces has been included in the report. • This report identifies the global small arms market under different segments such as gun type, cutting type, operation type, applications, and region. 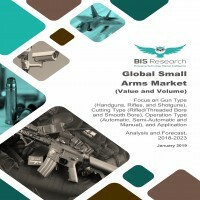 • The global small arms market for the major regions, including North America, Europe, Asia-Pacific, Latin America, Middle East, and Africa, has been analyzed in the report. • In the company profiles section, the study provides a detailed analysis of the 15 key players in the global small arms market, including Browning International S.A., Sig Sauer Inc., Colt’s Manufacturing Company, Beretta Arms Company, FN Herstal, Singapore Technologies Engineering Ltd., Taurus Holdings Inc, Glock Inc., Remington Outdoor Company, Heckler & Koch AG, American Outdoor Brands Corporation (Smith & Wesson), Israel Weapon Industries (IWI), Kalashnikov Concern, O.F. Mossberg & Sons, and Sturm, Ruger & Co. This section covers business financials, company snapshots, key products and services, major developments, and the individual SWOT analysis. There has been an increase in the overall defense spending of various countries all over the world. The growing defense budget of the different countries is playing a major part in the defense modernization program adopted for strengthening a nation’s military forces. The U.S. Department of Defense (DoD) had the highest defense budget of $611 billion for FY 2017. Asia-Pacific is one of the emerging regions that is continuously increasing expenditure on defense in order to develop the military power. Some of the leading players in the global small arms market includes Browning International S.A., Sig Sauer Inc., FN Herstal, Colt’s Manufacturing Company, Beretta Arms Company, Taurus Holdings Inc, Glock Inc., Remington Outdoor Company, Kalashnikov Concern, American Outdoor Brands Corporation (Smith & Wesson), and Sturm, Ruger &Co., among others. The preceding figure illustrates the increasing revenue generation of the global small arms market over the years. The market reported a revenue of $8.37 billion in 2018 and is expected to grow at a significant CAGR during the forecast period 2018-2023. The global small arms market has been segmented into four-gun types: handguns, rifles, shotguns, and others. The rifles gun type market acquired the largest share in 2017; however, shotguns gun type market is expected to grow at the highest CAGR during the forecast period, 2018-2023.